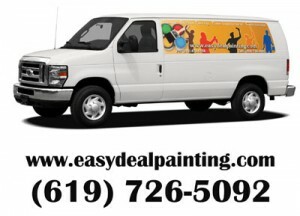 If you’re looking for a qualified San Diego County Area residential painter, look no further than Easy Deal Painters. Almost nothing can increase the beauty and value to your home like a fresh coat of paint. It’s one of the most cost-effective renovations, yet can drastically improve the impact of any room. Colors can invoke many different moods in people and nobody understands this better than us. Whether you’re looking to increase the market value of your house or simply want to add liveliness and warmth to your home, we know how to get the job done quickly and with minimal disruption to your daily routine. Customer satisfaction is our first priority. We provide free estimates and are fully licensed and insured. Sleep soundly knowing that your painters are pre-screened and background checked. In addition we will fully restore and clean up your room upon completion. Customer satisfaction is guaranteed. We even have evening and Saturday hours available! We not only value our customers, but the environment as well. We will use nothing but environmentally safe paint to assure the safety of you and our planet. Public areas of apartment buildings – hallways, lobby, etc. Easy Deal Painting Service is a small painting company offering high quality residential and commercial property painting. Each project is closely monitored by the owner beginning with color choice to the last stroke of a brush, Easy Deal Painting provides “one client at a time” service. In spite of our size, Easy Deal Painting is a full service painting contractor. We utilize the most up-to-date tools available in order to minimize disruption to the existing environment and attain only the most desired results for interior finishes.